I have a few more boxes to share today. I made four more boxes on Tuesday. I have more free time now since I don't have to go to work for a while. Yay! to that. Now you would think it was a lot of boxes for one day. When you duplicate the same item, it didn't take as much time at all. Plus I had all the embellishment already so each box didn't take much time at all. I forgot to take a picture of the purple box before I sold it. So here are 3 of them. I have two different ways to make this box. Note to myself: water color papers are very sturdy their thickness are up to 140 lb perfect for this project. cut off where I marked with the "X" (1 1/4 x 6 inches) Then fold on all score lines and make 4 cuts where indicated. You can use die cut for that area but it will be difficult when you decorate the box later so that was why I just cut it straight. Assemble the box. The finished size for this box is 2 1/2" depth x 4 3/4" tall x 6" long. Here is another way and this was the one that I used. The box came out very sturdy! take this piece and adhere to the other piece. 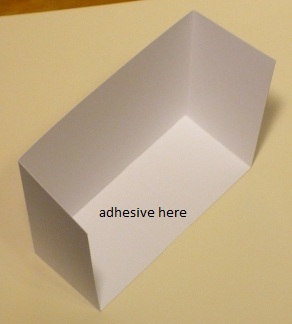 Apply adhesive where indicated and that is the box. The lid is the same measurement for both boxes. Assemble the lid and decorate your box. The finished size for this box is 2 1/2" depth x 5" tall x 6" long. I hope you will give this box a try. 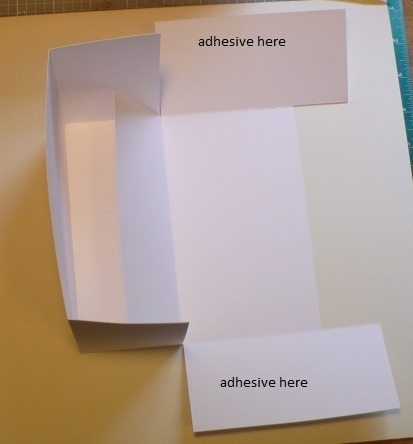 The tutorial looked like lots of work but it is a very easy box to make. Thank You Helen so clearly explained! First time in your blog and amazed by your talent and creativity! Everything looks so pretty and I esp. love all the crochet work you've done. Such darling boxes... your creativity is so inspiring. Thanks for the tut. Glad that you have a day off. beautiful cards, thank you for sharing!! The boxes are beautiful, thanks for the tutorial. Terrific tutorial...thanks for sharing and I love how you decorated yours. Thanks for the instructions, too! More beautiful cards Helen. Thank you so much for the tutorial .